Welcome back for Day 9! 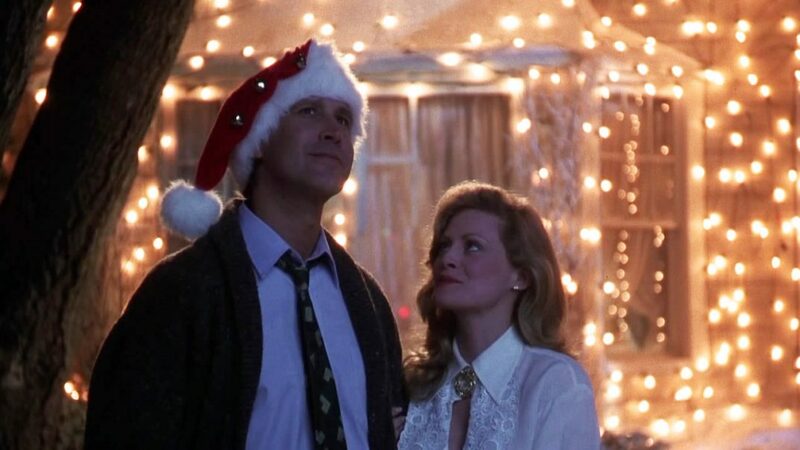 Today we’ll be discussing one of my personal holiday favorites: National Lampoon’s Christmas Vacation (1989). This is one that Charles and I disagree on, because he isn’t really a huge fan. That’s okay, though, because I love it enough for the both of us. Is it in the same league as It’s A Wonderful Life or Miracle on 34th Street? No, of course not. It’s silly, it’s zany, and it’s more than a little outrageous…yet this is a movie that is close to my heart. I usually have to be in the right mood to watch something in the Chevy Chase/Steve Martin/John Candy slapstick oeuvre, but I think I could watch Christmas Vacation just about any time. Go figure. Maybe it’s the additional influence of John Hughes’ writing, or the presence of Beverly D’Angelo and the rest of this specific supporting cast, but regardless: this movie makes me happy. This is the third installment in the National Lampoon’s Vacation series, and starry-eyed Clark Griswold (Chevy Chase) is back at it again with his idealistic dreams of the perfect family holiday. This time, however, his expectations seem slightly more attainable– rather than trying to trek across the country (or Europe, for that matter), all he wants is for his family to enjoy a fun, good-ol-fashioned Christmas at home together. Unfortunately for Clark, even that simple goal seems to slip further and further out of reach with one piece of bad luck after another. The tree (which, in direct proportion to Clark’s grandiose ideas about what family gatherings should be, is so “full” that it can’t be contained even by the walls of the house) shatters several windowpanes when released from its bindings, extended family descends upon the Griswolds from all sides, and Clark’s expected company bonus is mysteriously absent. Add to this a few more Chevy Chase-ian mishaps (i.e. falling off/through numerous surfaces, and the meticulous installation of 25,000 twinkle lights–none of which seem to want to work), and Clark finds himself at the end of his rapidly-fraying emotional rope. Thankfully, though, Clark and the Griswolds DO get their joyful family Christmas in the end (even if there are a few more dead cats and sewer explosions than they bargained for). I’d wager that when most people think of this movie, they think of Clark’s obsession with the twinkle lights, or Cousin Eddie cutting back on his squirrel consumption because it’s “too high in cholesterol”. It’s true that those scenes are both funny and memorable, but the scene that always sticks with me the most is when Clark accidentally gets trapped in his attic. He gets conked in the head by several loose floorboards, as well as having to don his mother’s mink wrap and gloves to stay warm, but then something unexpected happens. In the middle of all this successful slapstick comedy, he finds an old film reel of Christmas memories from his childhood. Sitting in the floor of his drafty attic, dressed in women’s clothing, Clark watches the reel as Ray Charles croons “The Spirit of Christmas” in the background. Suddenly, we’re not laughing anymore. We see Clark’s eyes misting up (and if you’re me, and you get emotional over Folger’s coffee commercials at Christmas time, your eyes start to mist up as well), and it becomes all too clear what his desperate holiday antics have been trying to recreate. It’s such a powerful scene. Here is a person who, unlike so many of us, has never lost his grasp on how magical the Christmas season can be– even when he’s engrossed in seemingly insignificant minutia, like his 25,000 decorative twinkle lights, it’s all in service of making the holiday special for his family. He wants them to have the same warm memories that he has of Christmas, and at the end of the day, I think that’s what makes the movie so relatable. Yes, it’s a comedy, so everything is exaggerated to the Nth degree. But really, we’ve all been through a semi-dysfunctional family Christmas where you think everything is going to be covered in pillowy snow, pearls, and the dulcet tones of Bing Crosby…and the reality is that your cousin Kurtis stands too close to a candle and lights his sweatshirt on fire. It’s very nearly impossible to create a “perfect” Christmas for yourself and your family, but none of us will ever stop trying. To me, that’s part of the fun of the season–the memories we make, and the stories we accumulate, while celebrating each other and doing the best we can. Tomorrow, Micah takes the wheel to review another family classic: Home Alone (1990). Be sure to come back for that one, as well as the last few days of our 12 Days of Christmas review series! !